"... a new spin on sangria that'll ensure you'll always have a nice, cool glass close at hand. It's super fast, ridiculously easy, and it's sure to be your new summer fave." Dan of Patient Fisherman blog has been one of the earliest member from this site. In last six month he has been working on developing a streamlined screener for some of the methods discussed here. Many of you would have seen some of the list he has been putting up using momentum. He has developed a comprehensive screening machine for all method traded here. The screening also incorporates earnings data. 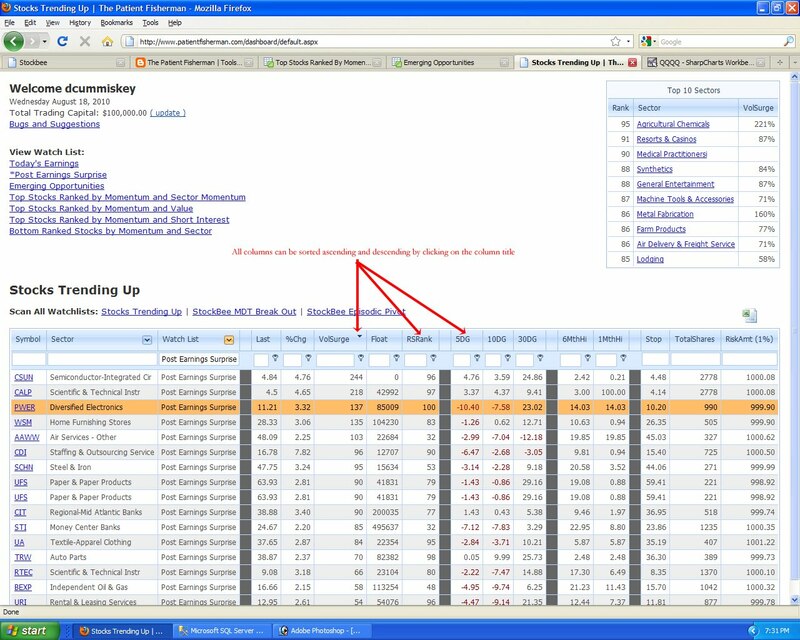 It allows you to track earnings breakout weeks or month after their earnings date. He will be launching his new screening app sometime next month. For stockbee members he is going to make the application available for preview before making it available to public. It is a standalone application and does not require Telechart. So those looking for cheaper online alternative ( I do not know how much he plans to charge for it to recover his development and hosting costs, but it will be much lower than what you pay for Telechart) will find it extremely powerful tool. I have been using it for last couple of weeks and it is a time saver. If you are interested in this powerful customised screener contact DC through his blog Patientfisherman. Below are screenshots covering some of the functionality found in the Bluefin Stock Screener. This should help you get familiar with the application before the launch. 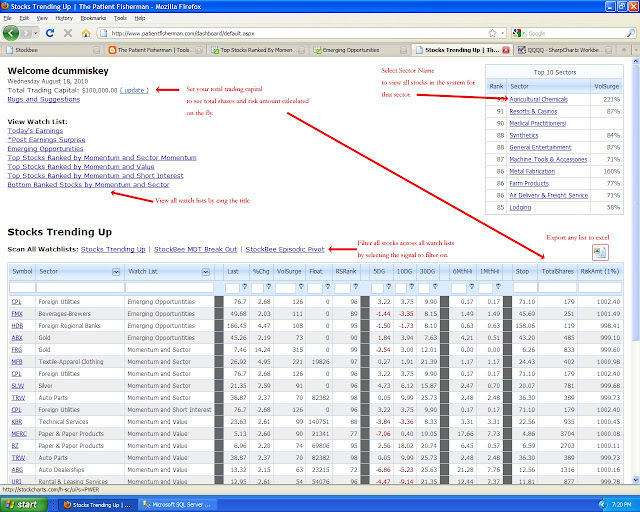 Also, I added a BONUS watch list - Post Earnings Surprises. We will be providing ADVANCED Access to all StockBee members. Details to come. 1. Scan for candidates across all watch lists on the selected entry signal. 2. All google watch lists are now accessible immediately through screener. 3. 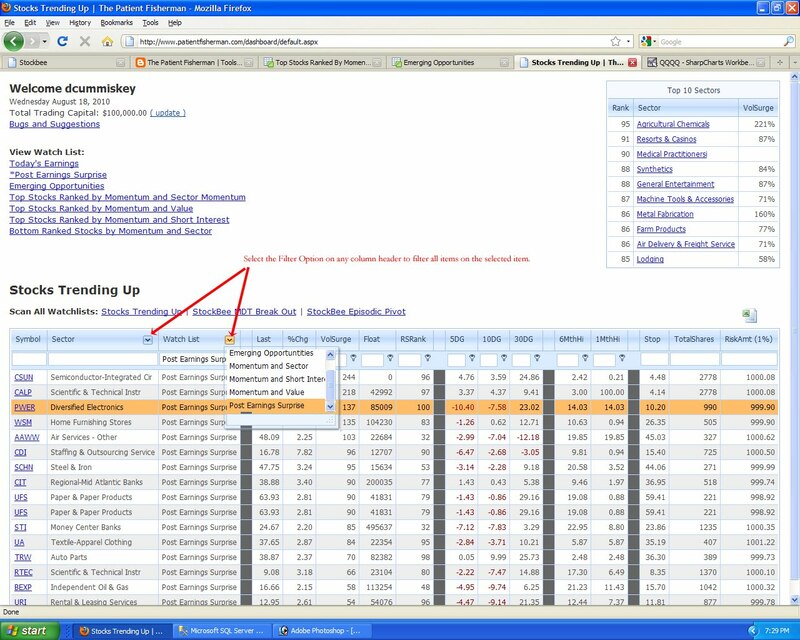 Stop, Total Shares, and Amount At Risk calculated on the fly based on your trading capital. 4. 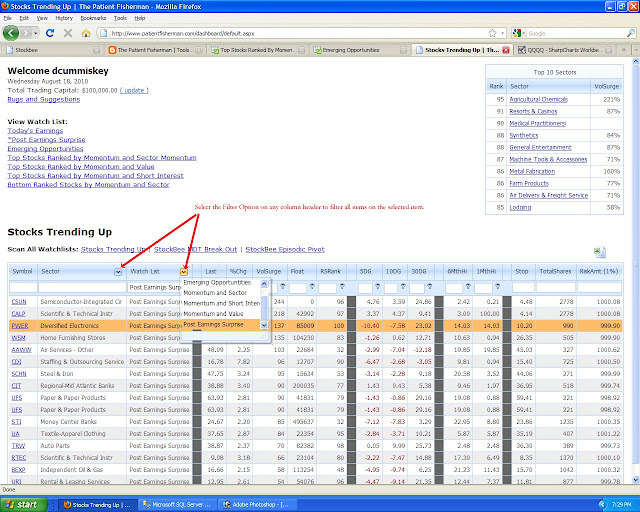 View the top 10 sectors through-out the day, along with the volume interest in each sector. 5. 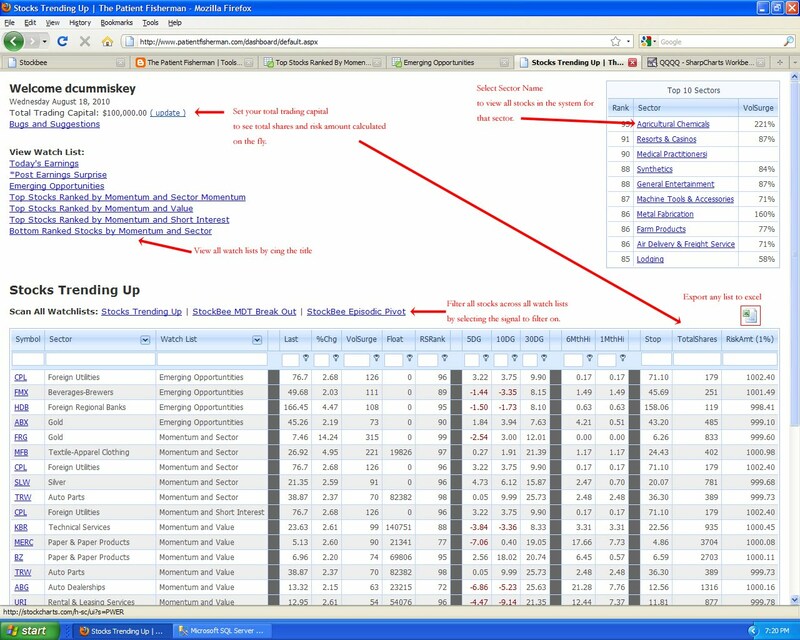 View stocks in any of the top 10 sectors by selecting the sector. 6. Export any watch list or scan to excel. 7. 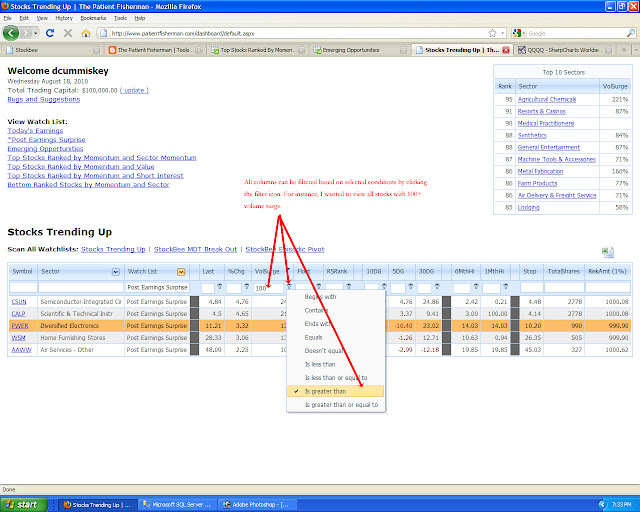 Filter any set of results by Sector or Watch List by selecting the Filter Arrow button and choosing your item. 8. Sort any set of results by clicking on the column header. 9. 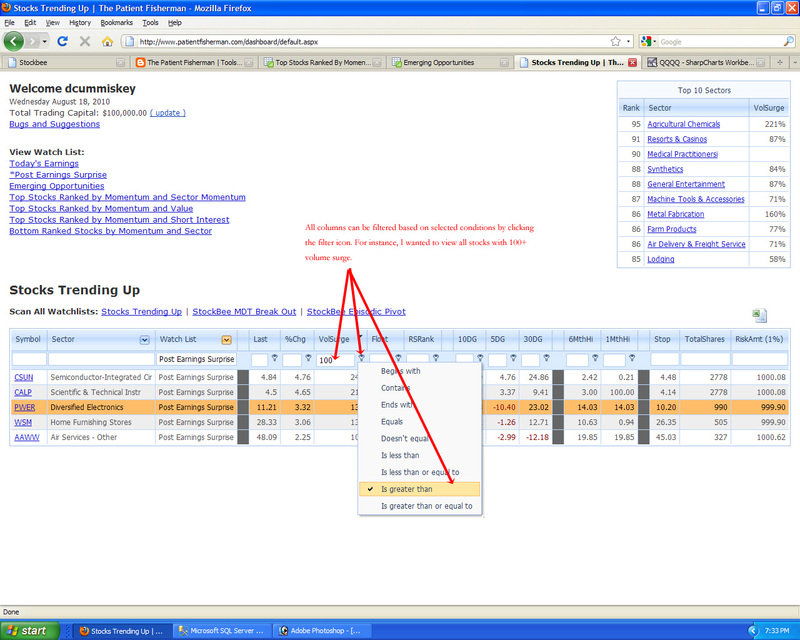 Filter any set of results by entering the filter criteria and selecting the condition you want applied to that criteria. Out of all the emails I get from the non members and the members, around 25% are about 401k. Everyone is in search of a simple solution which will give them high returns and wants to avoid bearish phases. They are looking for a simple pill which they can swallow and presto they will be good 401k investors. Last attempt at bootcamp kind format for was not successful for variety of reason like resistance to use of new technology, lack of time and complexity of the issue involved. If a instructing format fails it is the instructors fault. So I accept full responsibility for that botched experiment. So one must try another way so that instead of answering each email and answering same questions again and again I can do it more efficiently . Besides that like swing trading bootcamp, before conducting the 401k bootcamp I had spent enormous amount of time and effort going through thousands of site on 401k, several books on retirement planning , past archives of financial advise magazines, prospectus of major fund families and so on. So much so that I now need to buy more bookcases and storage ASAP to accommodate my new possessions from 401k and swing trading bootcamp. The Brazilian cleaning lady who came to clean my house yesterday was wondering where to put the piles of books and boxes. Beginning next week for next 6 weeks I will focus on 401K with series of blog posts detailing how you can approach 401K investing. At the end of six weeks I will compile all the posts in to one section and make it available as a reference document. The most critical thing you must learn if you want to be successful 401k investor is that you must design a approach. If the approach is logical and well thought out then you are in control of your own destiny. The market might do its own thing and it is not a controllable variable, but everything else I can do is controllable. For example how much to contribute, which fund to buy, when to buy, when to exit in under my control. If you concentrate your energies on controllable factors then end result would be profit. If you do that you will not be a lost sheep all the time asking question "what do I do now" . That is the essence of developing a method. After all the motto of Stockbee site is methods trump markets. Many people object to my use of 4% breakout method by saying it does not take in to consideration average range. A stocks average range might be 5% so a 4% b/o is not significant they argue. So you want to make simple average range breakout scan. In this PCF you can vary the AVGH20- AVGL20 part from 5 days to 63 days depending on what range you want to consider for breakout. A range breakout scan like this will produce less frequent signals compared to my 4% breakout scan. It is a impulse move. Or a price increase on high volume in very simple language. You people are making very complicated scans for it. Stock should have volume 10% higher than average 50 day volume. IBD uses a similar approach to find breakout on CANSLIM stock. The Stocks on the Move stocks are generated using this kind of scan. O'Neil in his book says on breakout day the stock should be up 50 cents and volume should be 40% more than 50 day average. In a strong bull market if you do not have breakout method you will never catch such explosive moves. In a strong market if you do not have a breakout method you are going to give up lot of opportunities.